Testing identifies several types of mold in the 10-year-old Spring Point Residence Hall, some of it low levels of 'black mold.' Some students say the school was slow to inform them of the problem. An SMCC official said the mold at Spring Point Residence Hall was caused by a faulty HVAC system that couldn’t keep up with recent hot and humid weather. A sign on the door Monday said the housing office had temporarily moved out. SOUTH PORTLAND — The largest and newest dormitory at Southern Maine Community College will remain closed well into September, displacing 320 students as school officials address a sudden mold infestation at the start of the fall semester. Mold stains ceiling tiles Monday in the third-floor hallway at Spring Point Residence Hall. Mold also was found on walls and furniture throughout the four-story dorm at SMCC. 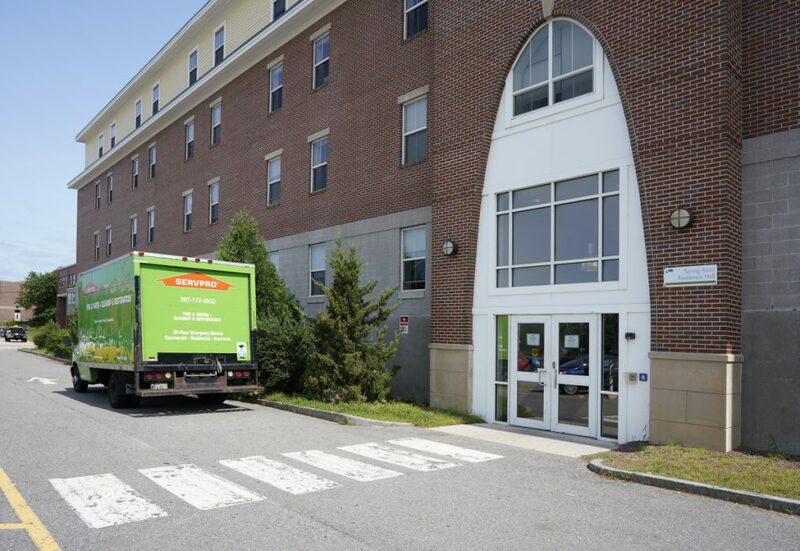 SMCC closed Spring Point Residence Hall on Sunday to allow mold remediation specialists to assess the building and test mold that appeared this summer on ceiling tiles, walls and furniture throughout the four-story dorm. The college made other housing arrangements for the roughly 60 students already staying at the dorm. Spring Point hall will be closed for three to four weeks while workers from Servpro, a fire and water cleanup company, remove all mold from the 10-year-old building, SMCC President Joseph Cassidy said Monday. The work is scheduled to begin Tuesday. The 260 students expected to arrive Friday for “move-in day” – three days before classes start next Monday – will be housed in local hotels on bus routes leading to SMCC until the residence hall reopens. Cassidy said students won’t be allowed to return to Spring Point hall until all mold is remediated, a malfunctioning ventilation system is repaired and independent testing ensures that the building is 100 percent safe. All affected students will be contacted directly to make housing arrangements, Cassidy said in a written statement. No cost estimate for the cleanup, alternative student housing and other expenses was available Monday. A small group of students gathered outside the Campus Center building Monday evening to bring attention to what they say has been a lack of communication between school officials and students affected by the mold issue. The protest, which drew four people, was organized on Facebook by Olivia Treadwell, a sophomore at SMCC. 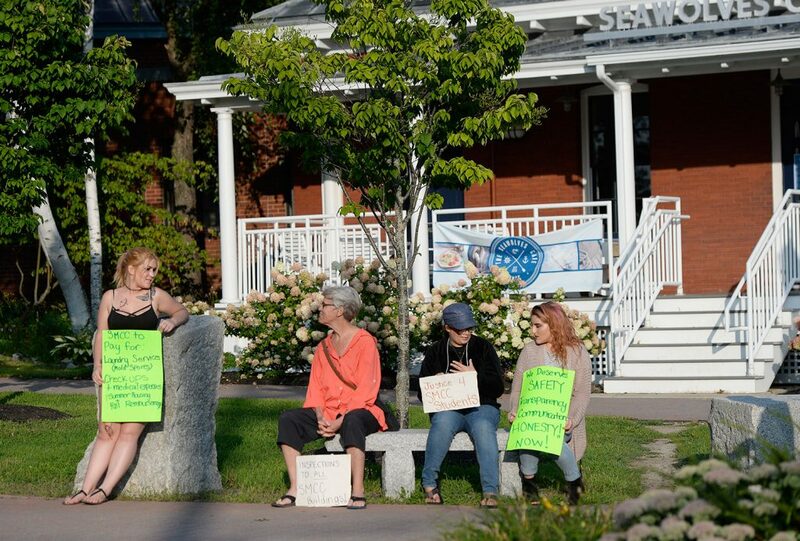 A small group protested at SMCC on Monday evening because of mold that shut down a dormitory at the college. Left to right are student Olivia Treadwell, community member Wendy Chapkis, and students Brianna Leach and Lauryn O’Connor. Treadwell said she wants SMCC to pay for laundry services to remove mold from clothing, for doctor checkups and medical expenses, and for summer housing reimbursement. Treadwell had moved into Spring Point hall two weeks ago. Treadwell said the media found out about the mold issue before students were informed, an allegation that college officials deny. Cassidy said the mold was first reported last week and was caused by a faulty heating, ventilation and air-conditioning system that couldn’t keep up with recent hot and humid weather. The resulting condensation allowed mold to form on the building’s ceiling tiles and elsewhere. Testing revealed several types of mold inside the building, but only nominal, non-threatening levels of so-called “black mold” were found, he said. Other types of mold that were black in color were detected, but they were not the same type of mold that people associate with “black mold,” he said. The roughly 60 student athletes and summer work-study students who were forced to move out of Spring Point hall on Sunday are staying in the 147-bed Surfsite Residence Hall, the college’s only other dorm, built in 1970. Although Cassidy said the mold problem was reported last week, some students said college staff knew about it two weeks ago and waited too long to take action. Gonzalez said a friend who worked in the facilities department posted a photo of moldy ceiling tiles on Snapchat in late July or early August. Most Snapchat posts are automatically deleted after 24 hours. Gonzalez has lived in Spring Point hall for two years. She moved into Surfsite for the summer because Spring Point hosts athletic and professional training camps in July and August, she said. Gonzalez had just moved back to Spring Point for the fall semester when college officials informed her Saturday that she would have to return to Surfsite on Sunday between 10 a.m. and noon because of the mold problem. Gonzalez said she received an email from the college Sunday night that said students likely wouldn’t be allowed to move back into Spring Point hall before classes start. Three students living at the dorm complained of physical reactions after the administration told them of the mold problem, Cassidy said. Indoor exposure to mold has been linked to upper respiratory tract symptoms, such as coughing and wheezing, and a stuffy nose, and red or itchy eyes or skin in healthy people, and can exacerbate symptoms in people with asthma, according to the U.S. Centers for Disease Control and Prevention. Some people, such as those with allergies to molds or with asthma, may have more intense reactions, such as fever and shortness of breath. Mold can be removed from hard surfaces by cleaning with commercial products, soap and water, or a bleach solution. Absorbent or porous materials like ceiling tiles, drywall and carpet usually have to be removed and thrown away, the CDC says.